On August 14, 2004, at the 123rd National Encampment in Cedar Rapids, Iowa, Commander-in-Chief Kent Armstrong signed General Order #26. Item number two on this order awarded the Abraham Lincoln Commander-in-Chief Award to Charles W. Canney Camp #5. As stated in the order, the award is given to the “Most Outstanding Camp in the Nation.” This is the first time this award has ever been awarded to a New Hampshire camp! 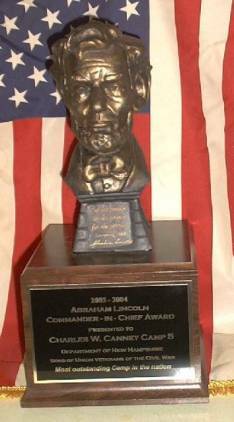 The Abraham Lincoln Award is given to the Most Outstanding Camp in the Nation, by the Commander-in-Chief of the National Sons of Union Veterans organization. Department of New Hampshire Senior Vice Commander Dan Murray stated that "in July of 2001 he presided over a meeting held at the New Hampshire Veterans Association in which the Camp 5 was chartered and he would have never guessed that a little over three years later he would be at a National Encampment accepting the Abraham Lincoln Award on behalf of Charles W. Canney Camp No. 5." The Abraham Lincoln Award is the highest award given by the National organization and was started in 1994. The award is given to the Camp that went above and beyond promoting and preserving the memory of the Union Veteran. This is the first time that a Camp from New Hampshire or New England has won this award. Some of the projects the camp is working on is: stopping the sale of veteran grave markers on eBay, antique shops and flea markets, helping N.H. communities raise money needed to restore their Civil War monument, updating town's civil war veteran history, raising money in towns that do not have a Civil War monument so they may have a memorial for their veterans, Civil War grave registration, school and organizational talks and displays. At the 122nd Annual Department Encampment held last April the Camp received the New Hampshire Department Commanders Award for the second year in a row.